Still room for Dusty in dugout? 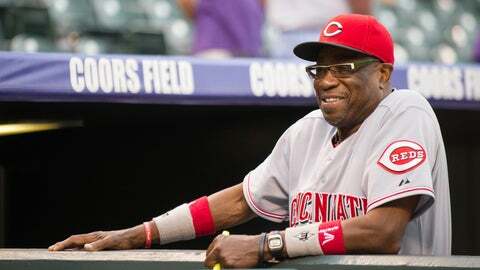 Might we see Dusty Baker managing in the majors again? If he has anything to say about it, you bet. And according to MLB.com’s Barry Bloom, Baker recently had a two-and-a-half hour interview for the vacant Nationals post. But is he too old, at 66? Baker sure doesn’t think so! "I’d like to be back in the right situation before it gets too late," he said. "A lot of people think it’s too late already, but I’m the coolest old dude there is. I don’t think I really compare to too many people. [Age] doesn’t matter. How old was Casey Stengel? I’m younger than Tony La Russa. I’m younger than all of those dudes [Bobby Cox, Joe Torre, Jim Leyland] when they left. Plus, I’ve got a 16-year-old that keeps me hip about how to deal with everybody. Well, Casey Stengel was only 61 when he signed on with the Mets. But people generally take better care of themselves these days, and I’m willing to bet dollars to doughnuts that Dusty smokes and drinks a lot less than Casey did. Still, Tony La Russa was "only" 67 when he quit managing. Jim Leyland was 68 when he quit. Bobby Cox was 69 when he quit. Joe Torre was 70 when he quit. Torre is Baker’s best argument. Because unlike the other guys, Torre didn’t quit after a long tenure with his club. Torre was 67 when he signed on with the Dodgers, and that worked out pretty damned well. If Baker does manage next season, he’ll turn 67 in June. Well, he’ll almost certainly turn 67 in June either way. But you know what I mean. When Dusty Baker says he’s "the coolest old dude there is," I believe him. But a prospective employer will have to believe more than that. They would have to believe that a man on the edge of his late 60s has the energy for the grind of seven or eight months, and that someone well-known for eschewing modern analysis can adapt to modern sensibilities, at least a little. I think sometimes we confuse staying young with becoming young. There’s a big difference, and the former’s a great deal easier than the latter.